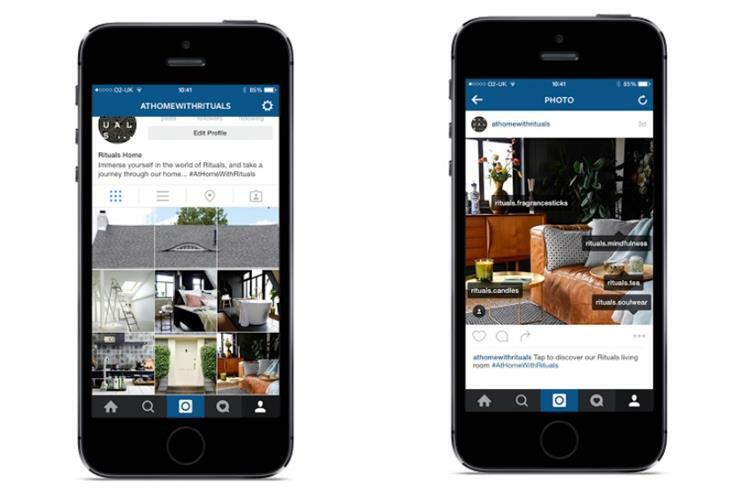 Homeware brand Rituals has launched an innovative Instagram campaign, launching 18 accounts that lead the user around different rooms of a house. Instagram users following the main Rituals UK account will see a picture of a key, which will be tagged with another account called ‘athomewithrituals’. Clicking through to the new account takes the user to a house, spread across nine picture panels. Each panel shows a different room, containing many more tagged accounts showcasing different Rituals products. For example, the picture of a bedroom contains multiple tags from Rituals’ range, including ‘rituals.diffuser’, ‘rituals.soulwear’ and ‘rituals.candles’. Along with products, some accounts, such as ‘rituals.sleeptips’, offer advice on health and wellbeing. Clicking through to the tagged accounts allows users to examine products in more detail, and purchase them through a URL posted on the account bio. The idea is to "submerge" the consumer into the Rituals lifestyle, according to Cat Turner, joint chief executive of agency Cult LDN. She said: "This is just the first iteration of [the Rituals] home. The intention is that the rooms will change and what’s in rooms will change. "Influencers will allow us into their bedrooms to show their Rituals home. The campaign will become seasonal, showing the Christmas home, for example." The UK remains a nascent market for Rituals, where the brand is largely perceived as offering body scrubs and candles. The idea of the campaign is to show off the entire Rituals range and boost the brand’s standing among Instagram’s millennial, largely female, audience. The global campaign will comprise a mix of organic and paid media.